Citadel Securities has quietly become one of the largest forces in U.S. stock trading. From the 35th floor of a downtown Chicago office tower, Citadel executes one out of every eight stock trades in the United States. At roughly 900 million shares a day, more stocks move through Citadel's systems than the New York Stock Exchange, which trades roughly 700 million shares a day. If you own a 401(k) or have ever used an online broker, your trades have almost certainly passed through Citadel. 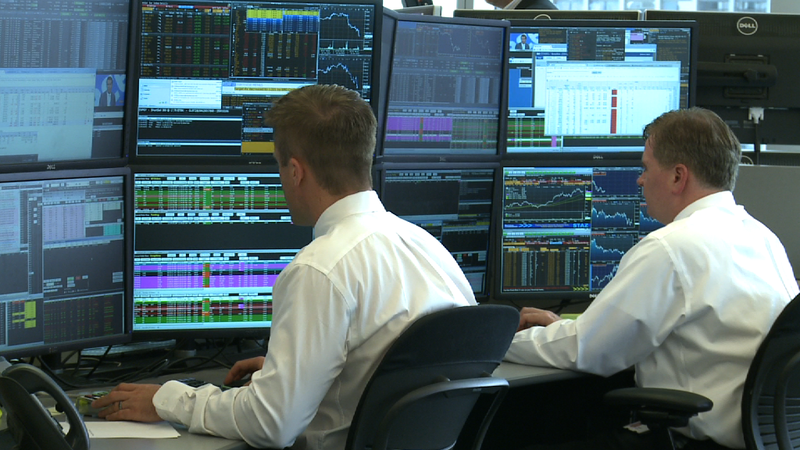 The most notable thing about the firm's trading floor is how eerily quiet it can be. About 40 people "run" the trading floor, but they are simply overseeing computers that use algorithms to fill and route stock orders. Welcome to the new world of trading: More and more, high speed computer programs are replacing thousands of floor brokers once seen running and yelling across the floor of the NYSE. Citadel's "floor" brokers don't do a lot of running. They sit together behind rows of computer terminals, clicking away on keyboards to ensure the firm's computers are operating correctly and are connected to all the right exchanges. In essence, Citadel's proprietary computer programs have become the new eyes, ears, and brains of the U.S. stock market. About 20 programmers create the computer algorithms that decide how to execute each order, and what to send to public exchanges or so-called dark pools. Dark pools may sound like the favorite haunts of Star Wars villains, but they are simply venues where buyers and sellers can submit bids without disclosing them to the public markets. Citadel operates a dark pool called Apogee out of its New York office. Citadel's programmers are constantly making adjustments as computers "learn" customer behavior to make the process more efficient. "All the decisions are made by the computers," Jamil Nazarali, Citadel's head of electronic execution, told CNNMoney during an exclusive behind-the-scenes tour. "The people here are not making any decisions with respect to whether an order should be filled or at what price it should be filled. That's all done in an automated way." Split second decisions: Citadel's computers execute a buy or sell order nearly instantaneously. When Citadel's computers do not to fill an order internally, the trade is pushed along to one of 13 public exchanges or one of more than 20 dark pools. By law, Citadel must match or give a better price than what's been quoted on a public exchange, said Nazarali. But some industry watchers question whether Citadel's prescient computer programs are always giving customers the best price. Nazarali says they do: "As a market maker, I have a regulatory obligation to fill all customers orders on my book before I trade." He said Citadel's systems actually create an even playing field between high-speed traders and retail traders who place orders through brokers like TD Ameritrade (AMTD) because they all have access to the same technology. The industry's primary regulator, FINRA, recently asked some market makers and dark pool operators to provide information on how they fill trading orders. Regulators are worried about high-speed traders get an edge over other investors in certain trading venues. It's unclear if Citadel was part of that group, and FINRA declined to comment. Trading is definitely faster, but whether it's better and cheaper for the average retail investor remains to be seen. -- CNNMoney's Jordan Malter contributed to this report.